Starts out with a gourmand blending of lemon & sweet vanilla but soon evolves into a very wood/forest-like fragrance of cedar, aromatic juniper, sandalwood, oudh & musk. There is also an underlying sourness that seems more related to the note of oudh than to the opening note of lemon. The drydown is clean white musk with a bit of the oudh sourness, and a vague, airy scent of cedar. Be the Sultan of your Kingdom! I love Al-Rashad Books. Alhamdulilah and may Allah continue to bless them. I love every product that I've got from this website and I shall continue to purchase years to come insha'allah. I didn't do a direct comparison, but to my nose this smells just a bit like escentric 01 -- a woody scent this is somehow consistently detectable but not in your face. In other words, it is paradoxically strong without being strong. Because of this, I am wondering if it might have iso-E-super, but just guessing here. Anyhow, interesting scent, probably best for cooler weather. 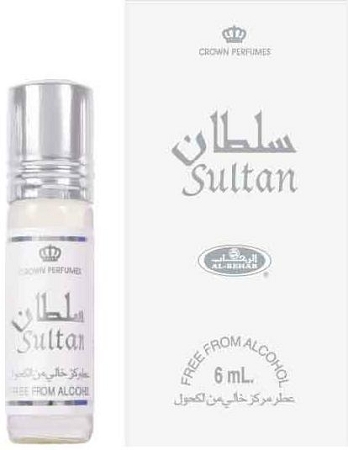 This one smells like Arab prince. Very nice smell!